High Triglycerides | Triglyceride Molecules Gallery | Guide - Full of Health Inc.
© 1998 Terry Brown. Reproduced with permission. 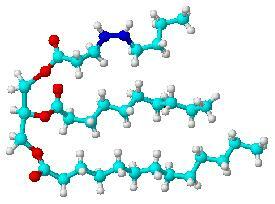 All triglycerides are made up of a fork-like structure: glycerol and 3 building blocks, called fatty acids. Triglycerides are formed by three successive condensation reactions. An enzyme catalyzes the reaction between glycerol and the fatty acids. Many different triglycerides can be formed depending of the type of fatty acids - lengthy chains consisting of 18 - 24 carbon atoms. For instance, a triglyceride with 2+ saturated fatty acids is a solid (eg. lard); a triglyceride with 2+ unsaturated fatty acids is an oil (eg. corn oil). trans fats - found in margarine, shortening and commercial peanut butters - contain double bonds artificially broken (hydrogens are being added, in a chemistry lab-type setting, to turn poly-unsaturated vegetable oil into trans fat that bears resemblance to saturated fat solid at room temperature); trans fatty acids are considered the "dangerous" fats. Any combination of saturated, monounsaturated, polyunsaturated, or trans fatty acids can be in a triglyceride molecule. And they are responsible for the physical properties of the fat. These polyunsaturated essential fatty acids must be supplied in the diet - without them we die. Good source of these fatty acids are fish. Fish, especially fatty fish, such as mackerel, lake trout, herring, sardines, albacore tuna and salmon, are the main predominant source of one particular type of essential fatty acids called omega-3 oils, rich in DHA and EPA - highly effective in reducing triglyceride levels and lowering the triglyceride/HDL ratio. What about Mono- and Diglycerides? Simply put, monotriglycerides and diglycerides are also fats. As opposed to triglycerides which are made of three fatty acids, monoglycerides have only one fatty acid, and diglycerides have only two. However, they affect our body in the same way all fats circulating in the bloodstream. Mono- and diglycerides are naturally formed from triglycerides during the digestion and absorption of every meal containing fat; also further amounts of these partial glycerides are being formed during the preparation of certain foods. Commercial mono- and diglycerides are made from glycerin and oils -- such as soybean, cottonseed, sunflower, or palm oil -- by heating them to very high temperatures to allow the fat molecules to rearrange with the glycerin. an emulsifier - to make bakery products taste smooth and to prevent the oil from separating out, in such products as peanut butter. Because of its ability to retard staling - the firming of baked products that occurs during storage - roughly 40 million pounds of monoglyceride is used annually in yeast-raised goods in the United States. At least an equal amount finds its way into cake icings or is used in the manufacture of margarine. Overall, this group of surfactants (emulsifiers) is the single most important one for food uses. Introduced in the 1930s, superglycerinated shortening was widely used for making high-ratio cakes (i.e., cakes containing more sugar than flour). At about the same time, the effectiveness of monoglycerides in retarding staling (crumb firming) in bread became known. In the 1940s, molecular distillation methods were developed to produce distilled monoglycerides, separated primarily from diglycerides. While triglycerides comprise most of the fat that we eat, mono- and diglycerides together make up less than 1 percent. As a common food additive, these partial glycerides are a part of our everyday, "normal" mixed diet, and are largely converted back into triglycerides in our intestines; their safety, however, yet to be fully established. On the list of ingredients of the commercial foods you buy, they are listed no higher than fourth on the label. Usually added in such small amounts, they contribute only an insignificant amount of fat to our diet. It should be noted, however, that ice cream, margarine, instant potatoes, chewing gum and commercial bakery products are not a part of a healthy, triglyceride-lowering diet. Glycerol (glycerine) - which is a trihydric alcohol, the backbone of triglycerides in the body - is the main source of carbohydrates in popular protein bars. 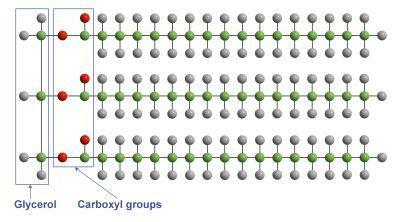 Since glycerol is very good at drawing moisture, it is used in bars to help keep them soft and moist. It also helps sweeten the bar. Although many companies do not list this as a source of carbohydrates, the FDA defines it as a carbohydrate. Glycerol has a very low glycemic index so it does not impact blood sugar levels greatly. enhancing hydration (maybe even enhancing vascularity). However, in some people, protein bars loaded with glycerol may cause stomach discomfort so unless you want to hit the porcelain throne throughout the day, drink plenty of water with these protein bars. Other, much less desirable carbohydrate sources in protein bars include corn syrup, high fructose corn syrup (dextrose), rice syrup, maltitol, honey (invert sugar), turbinado sugar, sucrose (which is a combination of glucose and fructose), crisp rice, and fructose. Fructose (fruit sugar) is added to bars not only to provide a source of carbohydrates but also to sweeten the product as it has a very sweet taste. Fructose is mainly metabolized in the liver and therefore has a lower glycemic index.